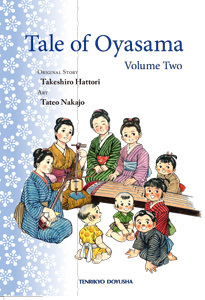 Volume two of Tale of Oyasama was published on January 26, 2017, by Tenrikyo Doyusha Publishing Company, following the publication of volume one in 2016. The second volume presents an English translation of Part Two of Gekiga Oyasama monogatari, newly revised edition (aidoku shinso ban), published in Japanese in 2008. This manga rendition, which is based on The Life of Oyasama, is intended to help English readers who may be beset by cultural challenges to better understand Her life and Her desire to save all people throughout the world. This volume of Tale of Oyasama covers chapters 4 through 6 of The Life of Oyasama, mainly focusing on the times of the construction of the Place for the Service, the composition of the Songs for the Service, and the identification of Jiba. Foundress, Life of Oyasama, manga, Miki Nakayama, Oyasama, Tale of Oyasama.